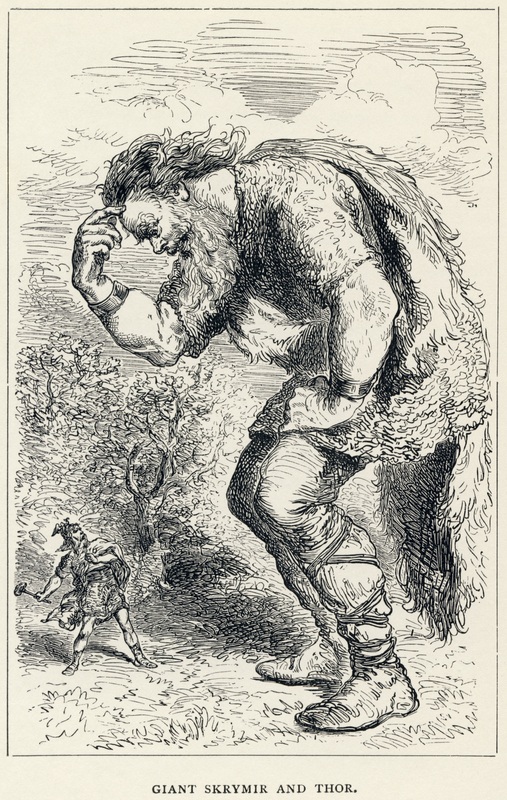 One of the better known stories from Norse mythology, or at least one of the ones I’ve come across most often, is that of Thor and Loki’s visit to the giants. There doesn’t appear to be much reason why they’re visiting, other than that Thor wants a challenge. A fair number of Norse myths seem to not really have a whole lot of mystical significance, but rather come across as just interesting adventures of the gods. That’s not to say there isn’t also some hidden significance, but a myth like this one stands alone quite well. It’s an amusing sort of tale, where nothing is at it seems. After Thor and Loki leave Asgard, they stop at a peasant’s house for dinner. Thor has a trick where he’s able to kill and cook his own goats, only to reanimate them with his hammer afterwards. The only problem is that this time, the boy Thialfi takes one of the bones, so one of the goats ends up with a limp. In payment for this, Thor takes Thialfi and his sister Roskva as servants. While Thialfi continues to play a role in the story, Roskva disappears after this. Did Thor send her to his hall in Asgard, or does she come along but not do anything? None of the versions of the myth I’ve read say one way or the other. 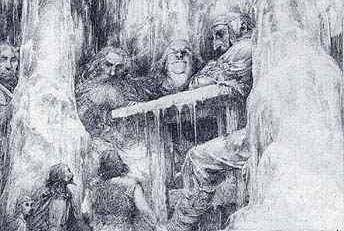 Regardless, after passing into the giants’ world of Jotunheim, the party spends the night in what appears to be a building with multiple hallways that just end, but turns out to be a giant’s glove. More of these tricks of perception occur when Thor and his companions reach the city of Utgard, and its king Utgard-Loki gives them a series of challenges, which they all fail. Loki loses an eating contest to someone named Logi because he only eats the meat and not the bones. Thialfi, an incredibly fast runner, still loses a foot race to the giant Hugi. As for the mighty Thor, he’s unable to drink the entire contents of a horn, lift a cat, or defeat an old lady in a wrestling match. Eventually, Utgard-Loki reveals the deceptions. Logi is actually a personification of fire, and Hugi of thought. The horn was secretly connected to the ocean, and the old lady was old age. As for the cat, it was actually Thor’s old enemy, the Midgard Serpent that wrapped around the entire world, in disguise. The serpent is actually Loki’s son, but apparently the disguise was good enough that Loki didn’t recognize his progeny. Thor, angry at the tricks, wants to destroy the city, but finds it has disappeared. Since none of these tricks were really harmful in the long run, it’s probably better for everyone involved that Thor didn’t get to take revenge. The guy is a bit of a hothead. It’s also interesting that Loki, a trickster of giant ancestry himself, is outsmarted by the giants of Utgard. I’ve always wondered about the giant king having Loki’s name as part of his own, but apparently nobody really knows what the name means. Speculation on Wikipedia has it that it might mean either “close” or “air.” The word “Utgard” apparently means “outyards,” probably indicating how the city is far afield of other civilized lands. 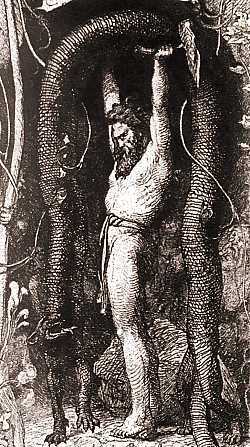 I’m not sure it was ever stated whether Utgard-Loki rules all the giants or just the one city. I think it’s the former in the Marvel Comics version of Thor’s adventures. 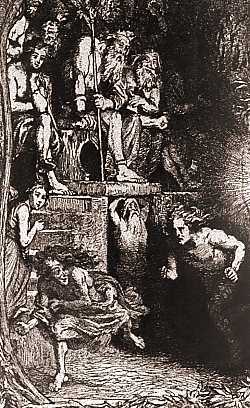 “Skrymir” was an alias Utgard-Loki used upon first meeting Thor. This entry was posted in Mythology, Norse and tagged asgard, giants, jotunheim, loki, roskva, thialfi, thor, utgard, utgard-loki. Bookmark the permalink.